A Test of Endurance: Beginning the hike at an unlikely trailhead disguised by a cul-de-sac, hikers are greeted with a gruelling single-wide gauntlet up the gulch. The trail is marked primarily by usage rather than signage. Challenging this mountain in the snow is impossible so unless hikers are familiar with the layout – this mountain is best climbed in the warmer months. A Waterfall: Halfway up the gulch, hikers reach a substantial waterfall that begins as a monstrous beast in spring and tapers off to a beautiful elvish-style mossy trickling waterfall in late fall. 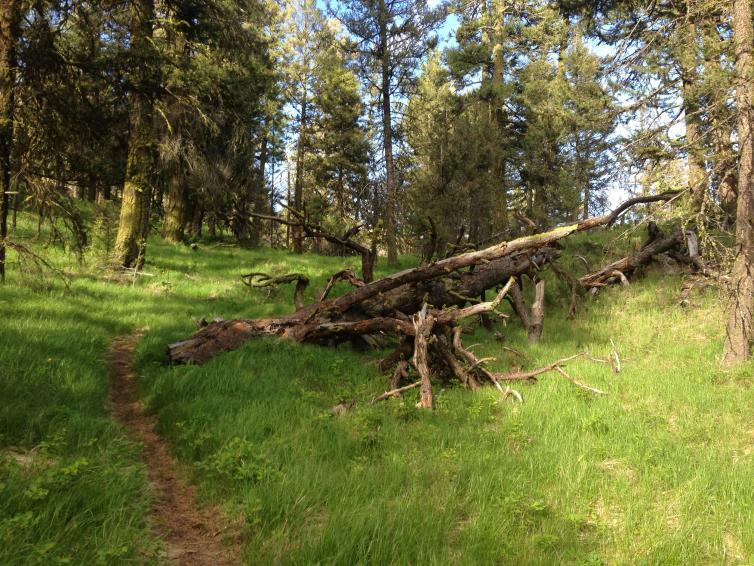 From the beginning of snowmelt until around mid-May, prepare to cross the stream numerous times or detour through the bush as it often engulfs the entire trail! A Summit Vista: This one actually has three! Vista one can be found as you approach the summit of the trail. Duck right for a short detour and then enjoy the isolated view of Mt. Boucherie. Vista two is at the top of the summit where you can pose for Vogue next to the Canada flag or the occasional Inuksuk. Vista three is found halfway down the return loop, at a massive boulder jutting off the side of the cliff. 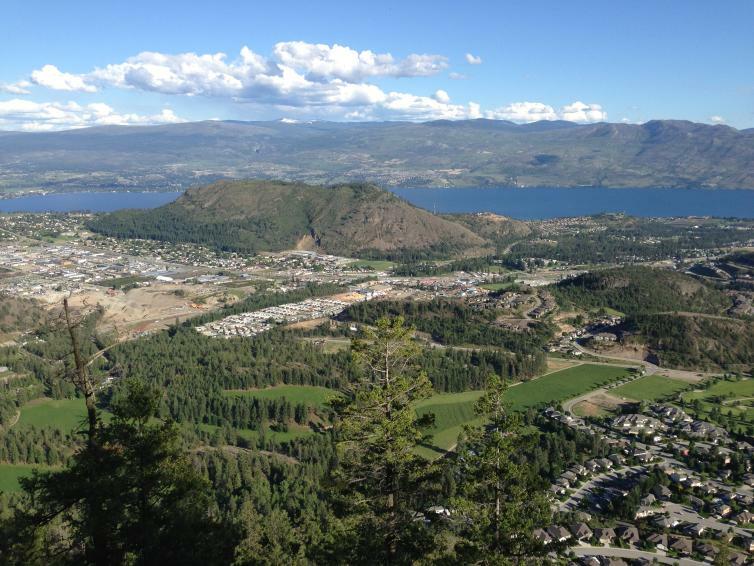 Dangle your feet in the air as you cast your sights on a breathtaking view that stretches from downtown Kelowna to the far reaches of West Kelowna, with a center piece of Mt. Boucherie giving an exposé to both Okanagan Lake and Okanagan Mountain Park. How to get there? Approximate address is 2334 Shannon Heights Pl, West Kelowna, BC. For the more tech savvy, plot 49.872223,-119.610252 into the GPS. 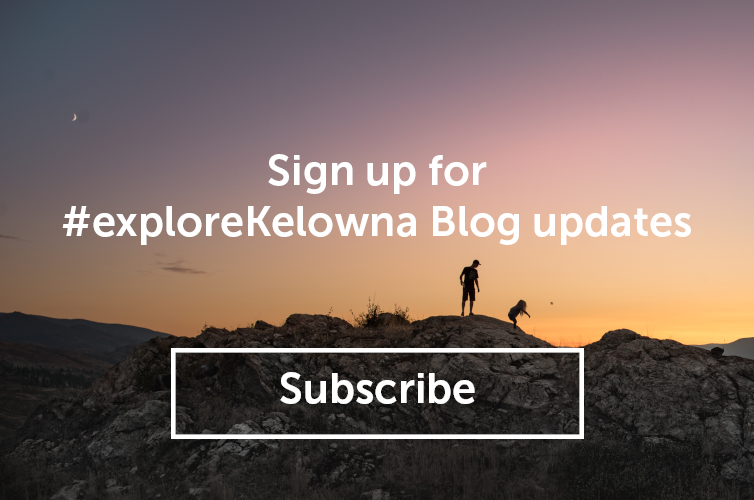 From downtown Kelowna, take the bridge into West Kelowna and turn right onto Bartley Road. Keep left onto Shannon Lake Road. Right on Shannon Woods Drive. Right on Shannon Hills Drive. Left on Shannon Heights Place. Park on the road, paying due to care not to block driveways or fire hydrants and head up the trail at the end of the cul-de-sac.